Amber Alert GPS, online at AmberAlertGPS.com, is the destination for equipment to locate where your child is. Amber Alert GPS offers a Smart phone application that can be used for the iPhone, Blackberry, Droid or any web-enabled phone. Amber Alert GPS also sells an Amber Alert GPS 3G device that allows a parent to call and be able to listen to whatever is going on around their child in the event the child does not have a cell phone. You can also buy car chargers, arm or ankle bands, and 3G faceplates at Amber Alert GPS. RetailSteal.com has the best Amber Alert GPS codes, Amber Alert GPS discounts, Amber Alert GPS coupons, and Amber Alert GPS promo codes. Shipping and handling rates at Amber Alert GPS depend on the pricing of your purchase and your shipping destination. See website for full details, exclusions may apply. Get 10% off an Amber Alert GPS device when shopping online. Click to save. Shop at Amber Alert GPS today and save $10 on your purchase of $100. Click to start saving. Save $40 on your purchase of an Amber Alert GPS with you sign up for a 2 year contract. Click to start. 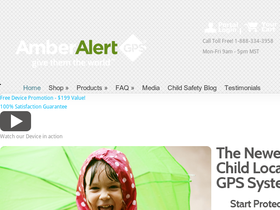 Get a free Amber Alert GPS Child Safety Package when shopping online. No purchase necessary. Click to save. Get a free parent survival kit with no purchase necessary when shopping online at AmberAlertGPS.com. Click to save. Buy the new and improved Amber Alert GPS 3G for only $199 at AmberAlertGPS.com. Click link to purchase. Download the new mobile app from Amber Alert GPS. Click link to download.